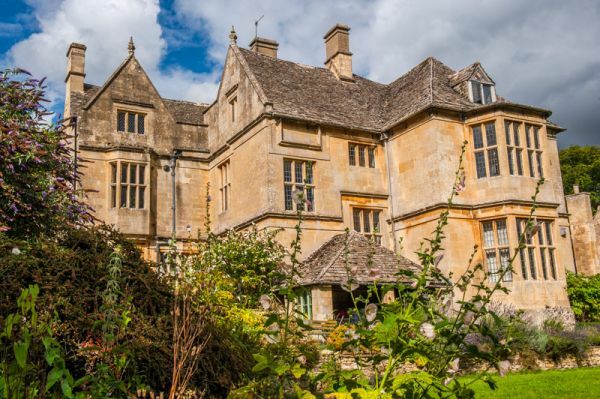 A lovely 16th-century manor house built of Cotswold stone, Whittington Court stands on the site of a much earlier medieval house and is surrounded by a moat. The house stands beside the parish church of Whittington, a small village near Andoversford. The interior of the Court features panelled rooms with Tudor fireplaces and a carved oak Jacobean staircase. The fireplaces feature a pair of beautifully carved overmantles salvaged from Sevenhampton Manor. One of the overmantle depicts the arms of Lawrence and Washington; the stars and stripes that were later used by George Washington to create the flag of the United States of America. 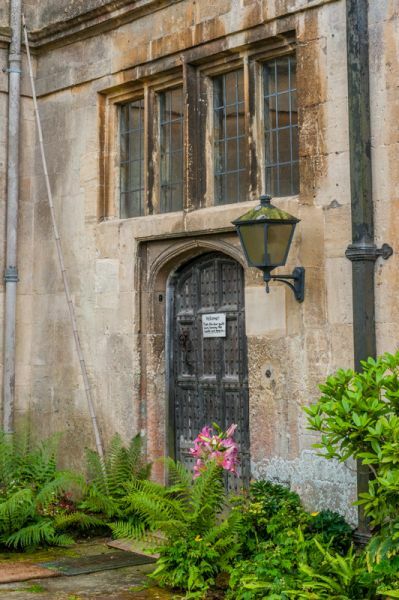 The manor of Whittington Court goes back to at least the early 14th century when Richard de Croupes was granted a license to crenellate the manor here. The first house was surrounded by a moat, of which you can still see traces. The current house was begun by Richard Cotton sometime prior to 1556. You can see Cotton's memorial brass in St Bartholomew's church, beside the house he built. 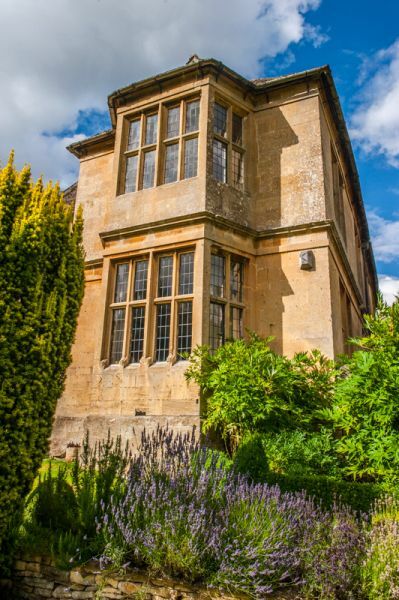 The Court was altered in the late 17th century and a further kitchen wing was added in 1929. The construction is ashlar beneath a stone slate roof. 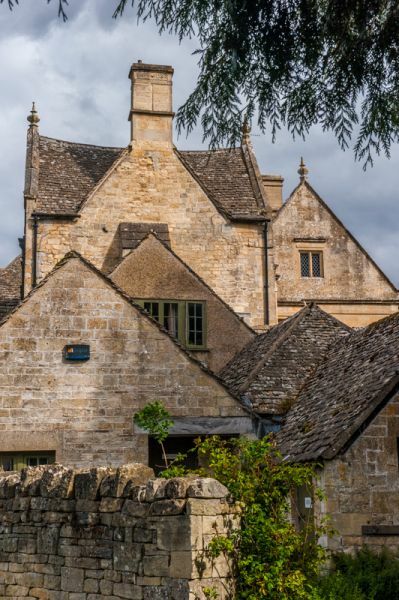 The house is composed of a central range (the old 16th century part of the house) with the 17th century east wing and 20th century west kitchen wings at right angles. The oldest part of the house stands three storeys high, while the east wing is two storeys. When Thomas Tracey died in 1770 he left no will and no immediate heirs. 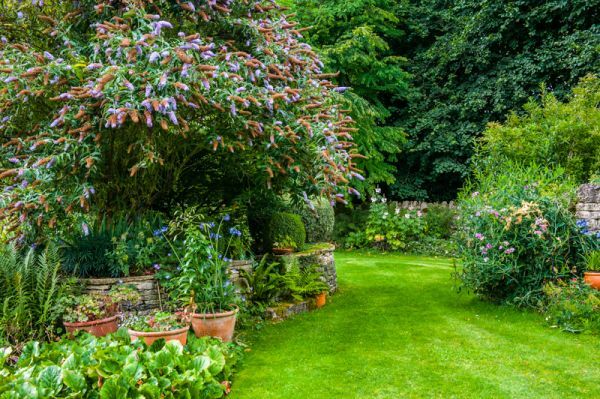 After a complex legal case that took 7 years, the house was inherited by a trio of London sisters. In a twist of fate the sisters also died without heirs, and once again the inheritance was argued through a complex legal case, with several claimants. After another 7 years of wrangling the estate passed to Walter Morris, and from him to the Lawrence family. The current owners are the Stringers, with three generations living under the same roof. Jenny Stringer is a well-known fabric designer, whose work has been featured in several popular magazines, including Period Living. Stringer creates intricate block-print fabrics, and you can visit her workshop on the top floor of the Court and buy hand-made fabric prints and cushions. Be wary if you use the Court's postcode in a satnav. Our satnav tried to direct us to Sandywell Park, on the south side of the A40. Whittington Court is actually across the A40, beside the parish church. If you ignore the postcode and simply take the lane towards Whittington village off the A40 you will almost instantly find yourself outside St Bartholomew's church, and catch glimpses of the Court through trees behind the church. 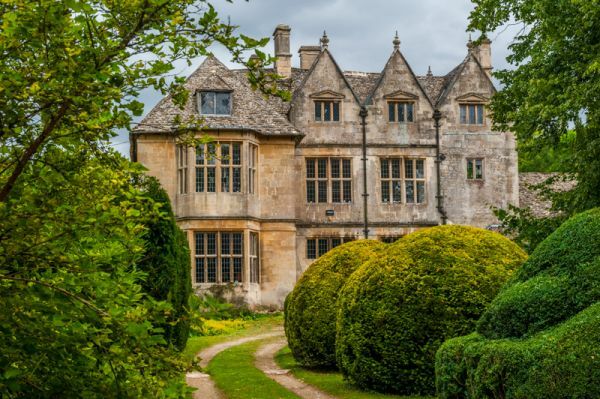 The approach up the curving drive to the manor house is one of the most idyllic in the Cotswolds; the drive is flanked by low topiary, and the house rises at the end of a long curve as if it has grown organically out of the surrounding foliage. The Court seems to be all gables and oriel windows, with projecting wings jutting out like afterthoughts. Standing at the top of the drive looking towards the 16th century front entrance evokes such a wonderful sense of timelessness. 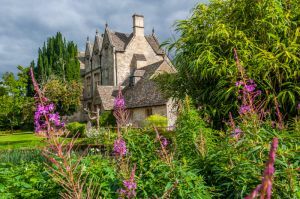 This is the Cotswolds at its very best. It seems that the 16th-century owners originally planned a traditional E-shaped house, but either the corresponding west wing was never built, or it was built and then torn down, we don't know. The result is a lopsided building, but one that oozes character and charm. We were guided around the house by 2 generations of the Stringer family. Our first stop was the drawing room, where we heard about the history of the house and the often convoluted way it passed down through the generations. From there we explored the oldest part of the house; the central block, containing the dining room. Then we climbed a magnificent Jacobean staircase to the east wing on the first floor, where the younger generation took over guiding our group. The east wing is fascinating; it appears to have been made as a traditional Elizabethan long gallery, spanning the entire width of the house. Shortly after it was built, however, the gallery was divided into 3 bedrooms by the simple expedient of putting up walls atop the floor joists. Perhaps they needed extra bed chambers because the west wing was never built. Then we mounted the Jacobean stairs to the top floor to explore Jenny Stringer's fabric workshop. Here you can see wonderfully dark and twisted exposed beams, black with age. Throughout the house are a fantastic range of glass and ceramics, for a former owner was a well-known collector. The range of fine glassware, in particular, is exceptional, with pieces dating back to the 16th century. After the tour we relaxed on the terrace with a cup of tea and enjoyed home-baked cakes. 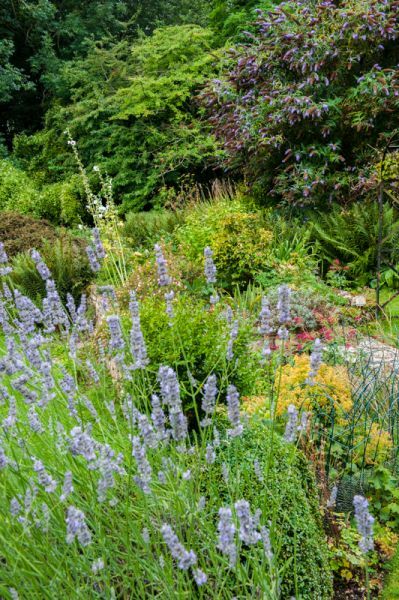 Then it was a quick wander around the gardens, which are not extensive, but were very colourful in mid-August. I absolutely adored Whittington Court. It is not a showpiece, but very much a family home, with all the quirkiness and character you expect from a much-loved and lived-in home. In 2001 the popular television series Time Team launched a 3-day dig in Waltham Field, about 600 metres north west of the manor house, searching for evidence of Roman occupation. The team opened 9 trenches and performed a complete geophysical survey of the site. What they found was a complex array of Iron Age and Roman ditches, trackways, and foundation walls showing a range of buildings erected around a central courtyard. More foundations were uncovered in neighbouring fields, including a possible shrine and an oven. The entire complex was surrounded by a wide rectangular ditch, and a narrower enclosure ditch dating to the Iron Age. After touring the manor house and grounds we went in search of the Roman remains, armed with an Ordnance Survey map. We crossed the road opposite the manor house drive and went through a gate, following a signposted public footpath into the nearby field. As you cross the field, running roughly parallel to the A40, you can clearly see wide ditches and evidence of a complex of earthworks and turf-covered foundation walls. Everything is covered by grass, and there are no information signs to explain the site, but you can easily make out the scale of the earthworks and the area defined by the foundation walls. We also saw wild deer grazing in the field. Immediately beside the manor house is Whittington Press, one of the most prestigious traditional hand-printing presses in the world. Whittington Press occupies the Court's former gardener's cottage. It was launched in 1971, using a vintage 1848 Columbian hand-press to produce limited edition works. The Press has received numerous awards for its printing, and publishes a famous annual review of book arts called Matrix. The Press has an annual open day if you want to know more - or you can just peer in the front door like we did! Limited Spring and Summer opening times. Please see the Historic Houses Association website for current details.